The Cumberland & Dumfriesshire Farmers Mart P.L.C. 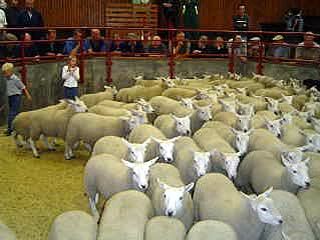 had forward 4,012 store and breeding sheep at their weekly sale at Longtown on Tuesday 15th December 2009. Store lambs met animated demand and were short of requirements. Top of £80.50 for Suffolks from High Crindledyke; Texel £78.50 Wydon Eals, £75.50 Bayldon, £74.50 Bayldon; North Country Cheviot £71.80 Carpet Farm; Charollais £69.50 Carslae, £68.20 Minto Kames; Beltex £68.80 Walton Woodhead; Lleyn £68.80 Lustruther; Greyface £68.80 Castlefairn, £63.80 Underbank, £63.20 Wydon Eals; Blackface £60 Blacksmiths Cottage, £59.80 Castlefairn, £57.50 Drummuckloch and Horseholm; Herdwick £57.20 High Aikton; Swaledale £50.50 Sheepriggs, £49.50 Underbank, £47.50 Greenleycleugh and East Kielder. The 602 Hill Cheviots were still extremely dear to a top of £58.80 Twislehope. Hill Northies to £67.50 Bradley, £59.80 Gospel Hall. Cast rams to £65.50 Candybank. Cast ewes to £83 Candybank. Greyface ewe lambs to £65 The Gall.